In its idealized state eating good food for me is not just about carving out a quiet space in which to savor something I love, but also a time to enjoy the company of friends, or myself, or even that TV series I can’t wait to tune into each week. I say idealized because while that frame of quietude may be the goal, as often as not I find myself wolfing something down while thinking about the various other tasks I need to do next.  It’s an internally noisy kind of experience that’s the exact opposite of my food ideal, and often a source of some disappointment—like when the movie-version of your life fails to even remotely resemble the less well-acted, well-lit, well-directed reality. This pull is one I’ve been acutely aware of during the past week as I raced through various recipes I wanted to try (not surprisingly, none of which hit the mark), and as I’ve attempted on a number of occasions to sit down and compose this posting. Sometimes the noise of life—the schedules, the emails, the whatever it is that keeps us running—has a way of making creativity really challenging. Or at least it has that affect on me. So this is my attempt to say STOP!, to find a little window of quiet… and yes, to write something about these braised lamp shanks that makes some sense. Let’s start with this: they’re wonderful, as is the recipe that helped me produce them. And this from someone who has never been a big fan of lamb… or for a long time didn’t think he was. That said, when I was in Morocco last December I found myself eating a fair amount of lamb, and liking it, which I suppose is one reason this recipe grabbed me when I came across it in the Jan. issue of Bon Appétit. On a superficial level it reminded me of the (many) lamb tagines I ate during my ten days there, though the truth is that the only real characteristic it shares with the classic North African dish is its slow cooking process. 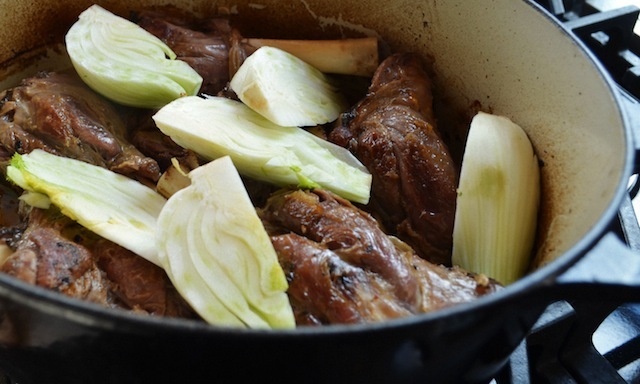 This, of course, is a key component of braising—a technique that has a number of advantages, not least of which is the wonderful flavor and texture it imparts on even the toughest cuts of meat, producing something that falls right off the bone. 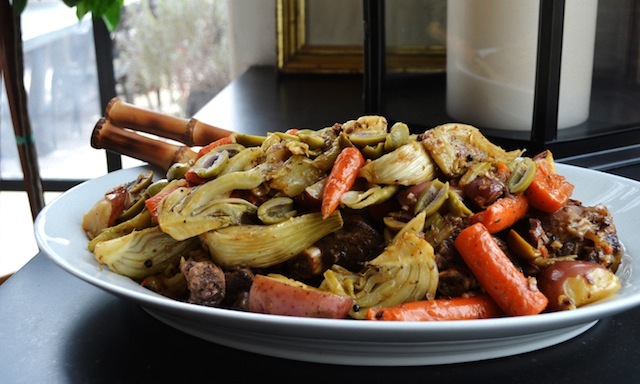 The other thing this particular recipe has going for it (and that differentiates it from any of the lamb dishes I ate in Marrakesh) is the presence of two large fennel bulbs (sliced into 1-inch wedges)—an element that once cooked lends the dish a subtle, aromatic sweetness. As such it’s the perfect counterpoint to the potatoes, the carrots, the olives, and, of course, the meat that also make up the dish. And all of these ingredients benefit from the presence of the braising liquid, which in this case is a mixture of white wine (or dry vermouth) and chicken stock—with the former imparting a mild acidity to the finished product. I’ll resist the temptation of walking you through the various steps involved in the actual cooking process, as the directions are listed below and require little annotation from me. I do, however, want to underscore the importance of searing the meat well prior to braising (it should be a deep brown color), as this step provides a wonderful caramelized quality to the meat while also imparting blasts of rich flavor into the braising liquid (the magical combination of fat and seasonings plus heat). It’s a critical process that’s aided by a fast cooking of the various base ingredients, namely fennel seeds, garlic, anchovies, thyme, and tomato paste, none of which is particularly distinct in the final tasting, but that together combine to deliver a depth of flavor to both the sauce and the shanks. 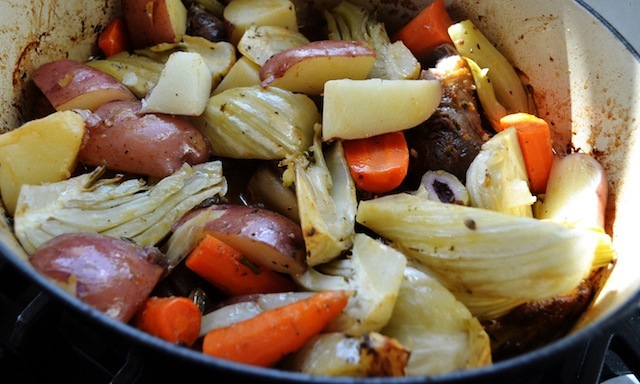 Having said that, the one tip I can offer is to work with a heavy pot that holds in the neighborhood of 7½ quarts (I used a 6½-quart size and had a hard time squeezing in my six pounds of shanks along with the braising liquid and the various vegetables). The other thing worth mentioning is that, as with any dish that involves slow cooking, most of the real work occurs in the early stages of the process (the chopping, the searing, the stirring), with the remainder completed in the oven. In other words, this is the perfect dish to make when you have a few friends coming over and don’t feel like racing around the kitchen while everyone is gossiping and telling funny stories in the other room. Also, as with any braised dish, the flavors will only deepen with an overnight stay in the fridge, so if you can, prepare the shanks the day before, then reheat them prior to serving (precise directions are included below). Although the magazine suggests the dish as the perfect cold weather meal, I also think it’s great for these early spring days when the temperature outside is still cool-ish, but it’s only just drifting into dusk as you sit down to eat. it’s warming and filling in just the way you want, while also being bright and sunny. Time it right and all that noise will just fade into the background. —Place a rack in lower third of oven; preheat to 325˚. 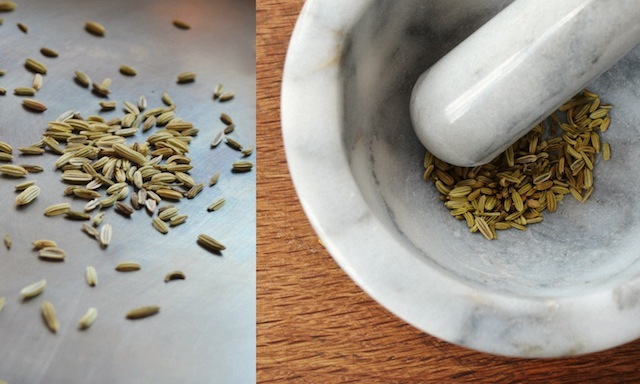 —Toast fennel seeds in a small skillet over medium heat until fragrant, about 2 minutes. Let cool. Grind in spice mill or with a mortar and pestle. 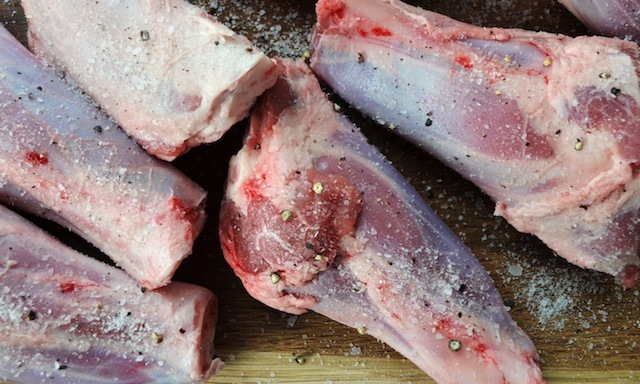 —Season lamb shanks with salt and pepper. Heat 2 tbs oil in a large heavy pot (about 7½ quarts) over medium-high heat. Working in batches, cook lamb shanks, reducing heat as needed to prevent overbrowning, until browned on all sides, 8 to 10 minutes per batch. Transfer lamb shanks to a plate. 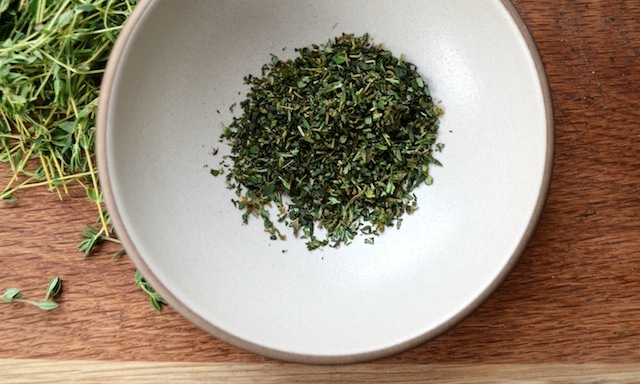 —Add remaining 2 tbs oil to pot and reduce heat to medium-low. Add ground fennel seeds, garlic, anchovies, thyme, and tomato paste and stir just until fragrant, about 1 minute. Add wine, scraping up any browned bits from bottom of pot. Bring to a simmer and cook until wine is slightly reduced, about 3 minutes. 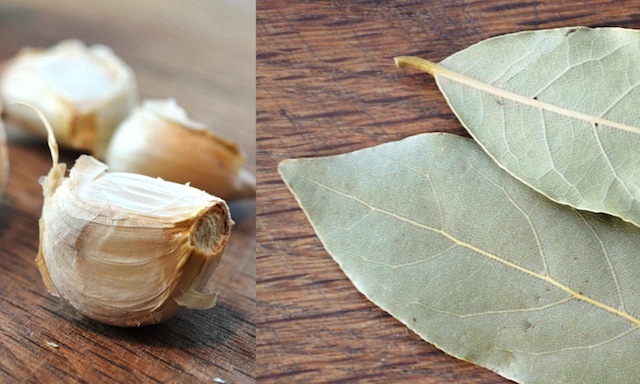 —Add broth and bay leaves. 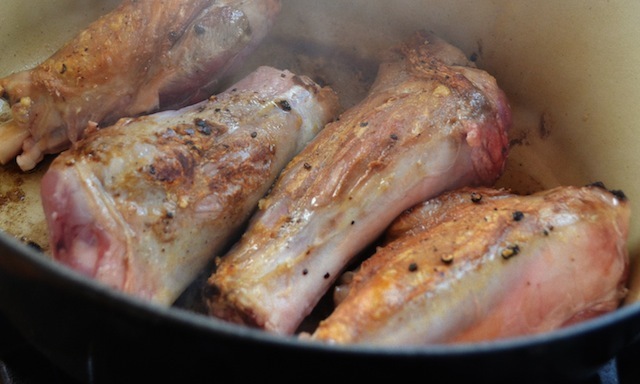 Return lamb shanks to pot, arranging shanks “head to toe” so they fit in an even layer (the meat should not be completely covered by the broth). Cover pot and transfer to oven. Braise for 1½ hours. 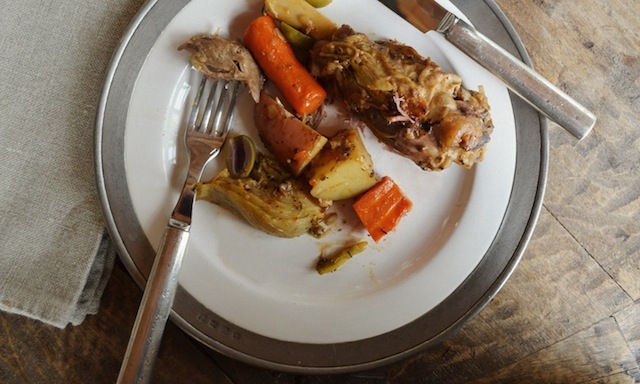 —Using tongs and a slotted spoon, transfer lamb shanks and vegetables to a serving platter. 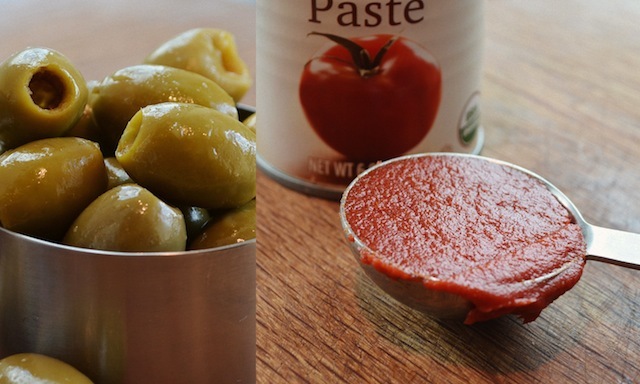 Scatter remaining ¼ cup olives over and cover with foil to keep warm. —Discard bay leaves from cooking liquid. Bring to a simmer over medium heat. Skim fat from cooking liquid. Simmer liquid until it thickens slightly, 15 to 20 minutes (you should have about 1½ cups). 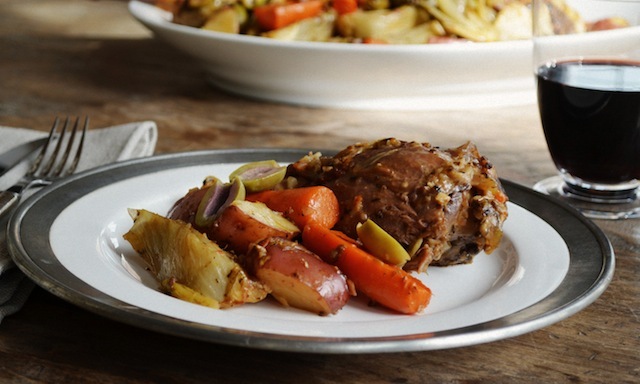 —Season sauce with salt and pepper and pour over lamb shanks and vegetables. Sprinkle with parsley. 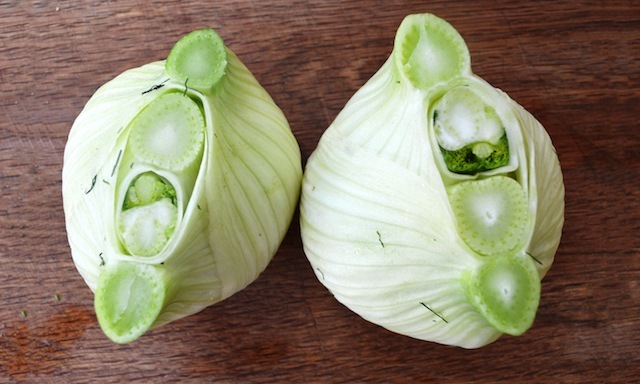 —Serve with a loaf of crusty bread for sopping up the juices.